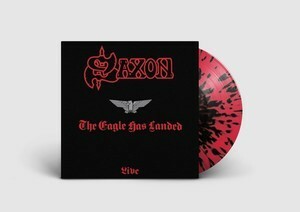 SAXON - THE EAGLE HAS LANDED LIVE RE-ISSUE VINYL (LP) | Online Shop | Wizard LTD. Album: "THE EAGLE HAS LANDED LIVE RE-ISSUE VINYL (LP)"
Originally released in May 1982, The Eagle Has Landed was Saxon’s first live album to be recorded and also the first album to feature long standing drummer, Nigel Glockler. Taking its name from the bands huge, eagle lighting rig it was recorded on the European leg of their Denim And Leather tour during 1981 and was mixed at Manor And Bray Sound Studio. It was an instant hit and reached number 5 in the UK charts upon its release. This edition features bonus live tracks recorded at London’s, famous Hammersmith Odeon during, sold out Saxon headline concerts from 1981 and 1982.